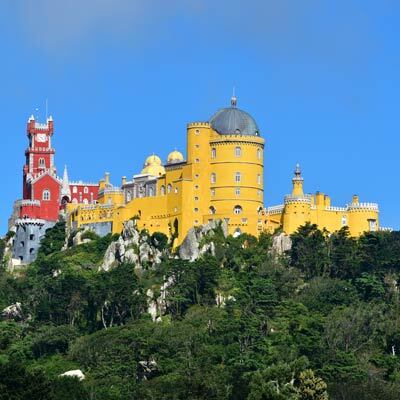 Sintra is a picturesque town that boasts extravagant palaces, ancient castles and stunning scenery. Sintra is only 25km from Lisbon, and is connected by a regular train service, which makes the town ideal for a day trip. 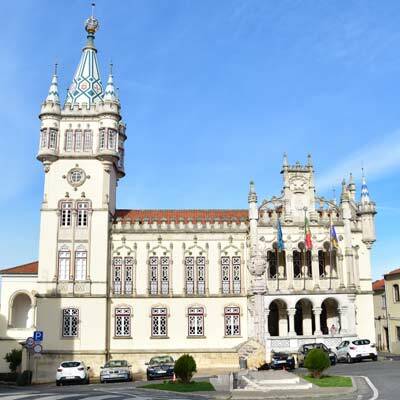 There is a popular daytrip route which visits the Palácio Nacional de Sintra, the historic centre, the Castelo dos Mouros and the Palácio Nacional da Pena. 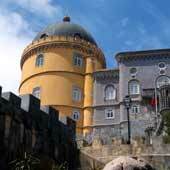 This itinerary visits the main cultural sights of Sintra, and is ideal if you only have a single day of sightseeing. 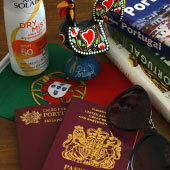 Warning: Sintra can get very busy during the summer months, so always start your day trip as early as possible. At the end of this article are variations of the itinerary, which can avoid some of the summertime crowds. 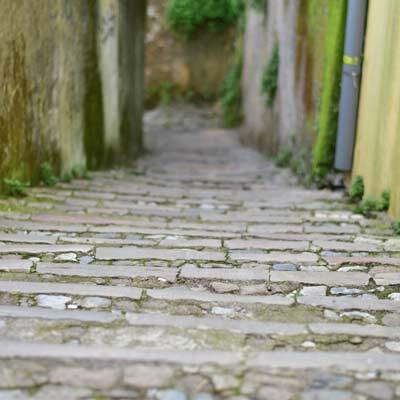 • Do not walk from the historic centre to the Castelo dos Mouros; the hill is very steep! Should I join an organised tour? 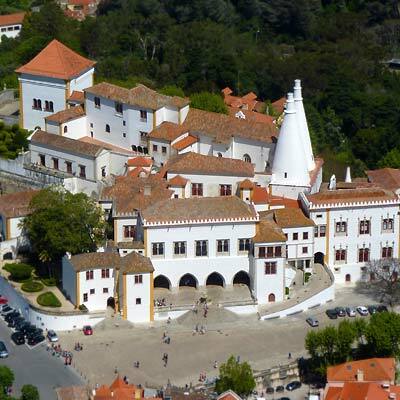 Sintra is a destination where an organised tour can be useful; there are steep hills separating the main attractions and a large portion of the day can be wasted waiting for public transport. 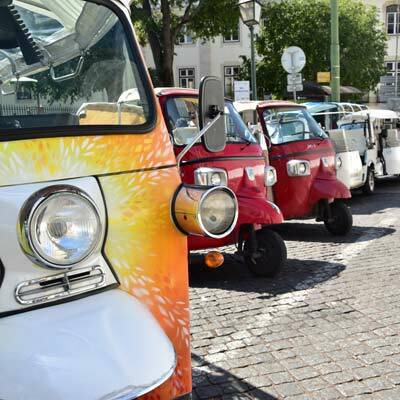 Note: An organised tour is essential if you plan to visit both Sintra and Cascais in one day; this route by public transport leaves almost no time for sightseeing. Only consider combining Cascais and Sintra if you are really limited for time, as both towns deserve a day each. 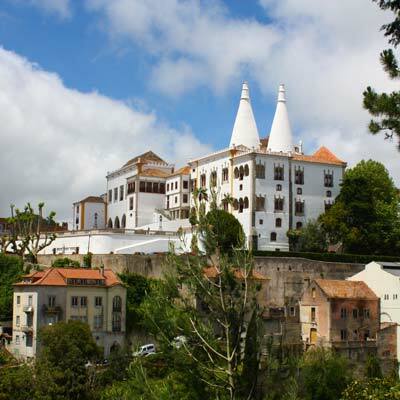 The following section explains in-depth the 1-day tour of Sintra. 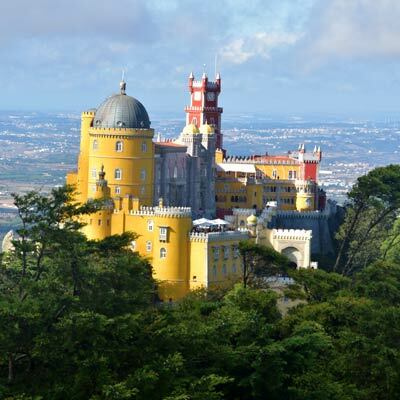 The recommended means of travel to Sintra is by train, and there are two train services which depart from Lisbon. The majority of visitors depart from Rossio station (GPS: 38.7143, -9.1407) as it is close to the popular tourist areas, while the Estação do Oriente station (GPS: 38.7675, -9.0991) is better for visitors travelling to/from the airport. 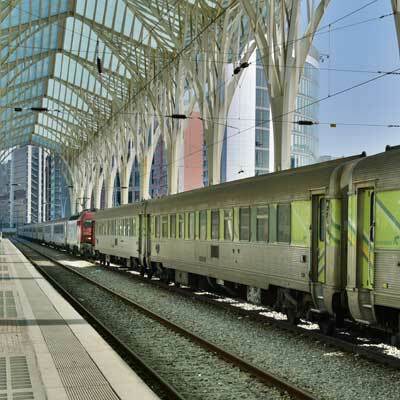 Both Lisbon-Sintra train routes have similar journey times (40min Rossio, 47min Oriente). 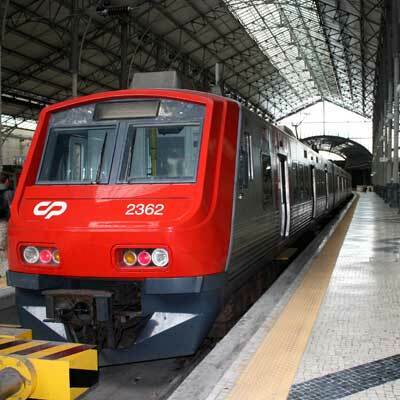 A single fare from Lisbon to Sintra costs €2.25/€1.15 (adult/child), and a return is twice the price at €4.50. There is a departure approximately every 30 minutes during daylight hours, and both services start early in the day and continue till late at night. Sintra train station (GPS: 38.7990, -9.3857) is the final stop of the railway, but the historic centre is 1.5km to the west (GPS: 38.79695, -9.39053). When exiting the station, it is not very clear which direction to walk, and this moment of confusion is when the touts pounce, trying to sell guided tours, tuk-tuk tours and other gimmicky tourist activities. These tours are very expensive when compared to the 434-bus service. Note: If you are considering a tour, it makes more sense to book a tour that picks you up from your accommodation instead, of wasting time catching the train. The walk from the station to the historic centre of Sintra is very scenic; to walk, follow the brown signs which say "Centro Histórico". 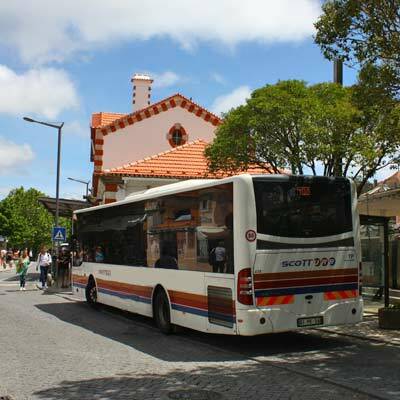 The 434-tourist bus provides an invaluable service as it connects the train station, to the Palácio da Pena and passes the historic centre and the Castelo dos Mouros. 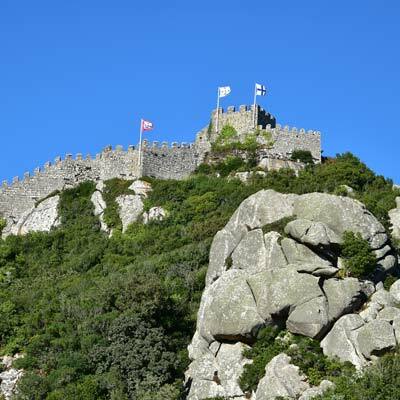 Without the bus, it is a 20-minute walk from Sintra train station to the historic centre, or a very demanding 45minute uphill hike to the Castelo dos Mouros and Palácio da Pena. A hop-on-hop-off bus ticket for the 434 bus route costs €6.90 or a single is €3.90, and there is a departure every 15 minutes during the peak season. Warning: This bus service can get very busy during the summer, and there can be long queues in the town centre, as tourists catch the bus up to the Pena Palace. The Palacio Nacional de Sintra (GPS 38.79748, -9.39062) is located at the centre of Sintra and is the first major attraction of the day. The palace has a gothic exterior and is distinctive due to the two huge coned chimneys that extend from the palace’s kitchens. This medieval palace was a favourite with the Portuguese nobility, being in continuous use from the 15th century through to the 19th century, making it the most used royal residence of Portugal. This extensive history is reflected in the varied interior, but many of the rooms follow a simplistic styling of cooling floor tiles, high vaulted rooms and beautifully painted ceilings. 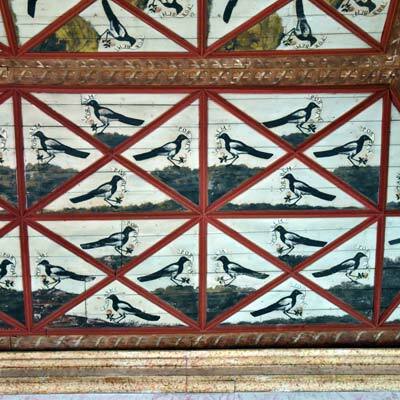 Highlights include the magpie room, the decretive throne room and the swan room. The historic centre of Sintra is a charming example of a Portuguese town; there are cobbled streets and traditional painted buildings filled with family-run cafes and unique shops. Highlights of Sintra include the flamboyant town hall, the busy tourist shopping streets of Rua das Padarias and the pretty church of Igreja de Santa Maria. There is a wide selection of restaurants and cafes in the centre of Sintra, and this is the best location for lunch. 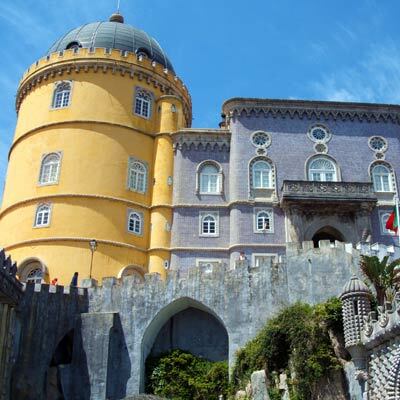 It is advisable to have food before heading up into the hills as there are limited and very expensive choices at the Pena Palace and Moorish castle. Insider tip: The Miradouro da Ferraria viewpoint (GPS 38.79628, -9.38991) has one of the best views of the town, and is a scenic setting for lunch. 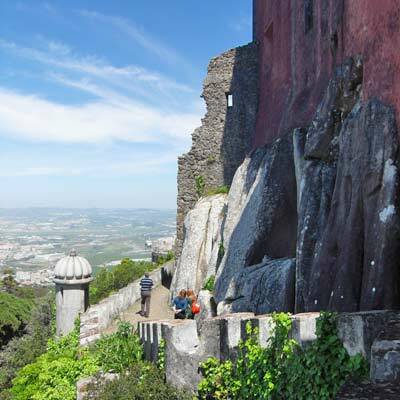 The next portion of the day climbs up into the hills of Sintra to visit the Castelo dos Mouros and the Palácio da Pena. For this day trip, we do not recommend hiking up the hills, as they are very steep and will waste a lot of energy and time, which is better spent exploring the main sights. It is suggested catch the 434 tourist bus, which departs from the plaza in front of Palacio Nacional (GPS 38.79700, -9.39040), but this is the busiest bus stop of the whole route. 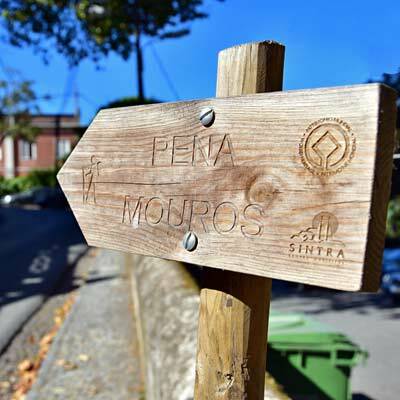 If you do insist on hiking up, the most scenic route goes through the grounds of the Vila Sassetti (GPS 38.79463, -9.39141) and passes the Penedo da Amizade cliffs (GPS 38.79209, -9.39123), which are popular with rock climbers. The Castelo dos Mouros was constructed by the North African Moors who ruled over the region between the 8th to 11th century. After the Christian Crusades drove the Moors out of Portugal (in the 12th century), the castle had little strategic importance and was left to ruin. The castle was only restored with the construction of the Palácio Nacional da Pena (in the 19th century), as a decorative feature for the grounds of the palace. This restoration of the Castelo dos Mouros followed the ideals of the Romanticism style of architecture; with the castle intertwined with the ancient forests, and hidden paths lead to wonderful viewpoints. 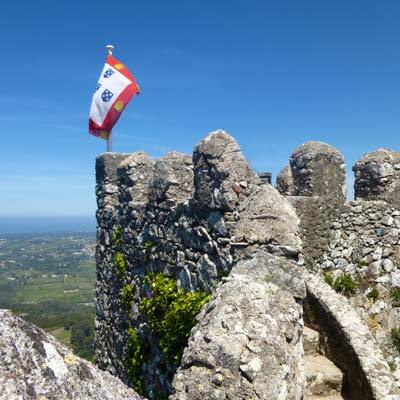 These wonderful views from the battlements are the main attraction for tourists, and the whole castle has a much calmer ambience than the other popular attractions of Sintra. 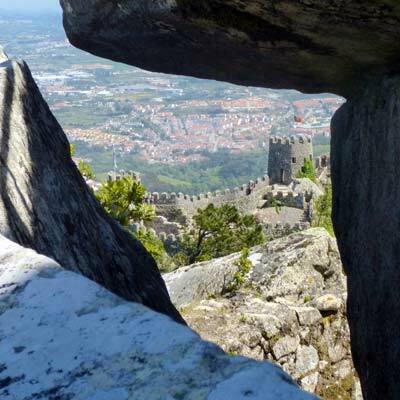 Advice: The Castelo dos Mouros and the Palácio da Pena are only separated by a gentle 400m walk and there is no need to catch the bus for this short walk. The Palácio Nacional da Pena is considered as one of the finest palaces in Europe, and will be the highlight of any day trip to Sintra. The vivid colours of the palace are at a stark contrast to the lush forest which surrounds it, while decorative stone carvings line the terraces. The interior of the Palácio da Pena is as equally fascinating, being restored to how it appeared in 1910, when the monarchy was forced to fee Portugal due to a revolution. As a visitor, there are two distinct areas of the palace complex to explore; the staterooms and the grounds. The cheaper “Parque” ticket (€7.50 adult) allows the exploration of the colourful terraces that surround the palace and forested grounds (known as the Parque da Pena). The “Palacio + Parque” ticket (€14.00 adult) allows entry to the staterooms, the terraces and the Parque da Pena. Warning: The staterooms can get very busy during the middle of the day. Parque da Pena contains over 200 hectares of forested walkways and hidden paths that surround the Palácio Nacional da Pena. The grounds are tastefully in keeping with the natural scenery of the region, but skilfully incorporates over 2,000 varieties of plant life, with many non-native species. 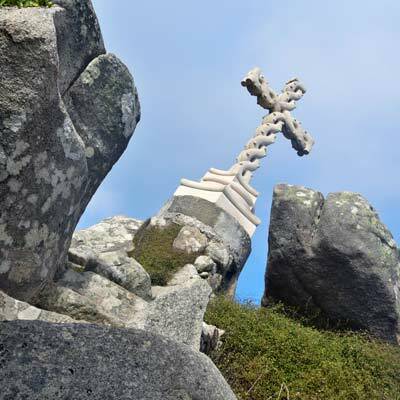 An enjoyable hike is to the Cruz Alta (530m, GPS 38.78204, -9.39134), the highest point in the Serra de Sintra and from this vantage point are wonderful views over the Pena Palace. The walk takes approximately 30 minutes and is well signed. Shorter walks lead to the statue of King Fernando. After exploring the Parque da Pena and Palácio Nacional da Pena (which could easily fill an entire day of sightseeing), catch the 434 bus to Sintra train station. As Sintra is the most popular day trip from Lisbon, the town can get very crowded during the summer months, and especially at the weekends. At the height of the tourist season, there can be extremely long queues to purchase tickets and over 1-hour waits for space on the 434 tourist bus. To avoid some of these queues, it is suggested to visit the Palácio da Pena as the first destination in the day and leave exploring the town (and Palacio Nacional) to later in the day. This avoids some of the crowds as the 434 bus route directs most tourists to visit the town first and the Pena Palace later in the day. Alternatively, consider visiting Sintra much earlier in the day; the first 434 bus service is at 9:15 and the train services to Sintra start before 7am every day. 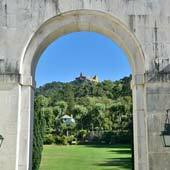 Sintra has significantly fewer visitors during the week (Monday-Friday) than at the weekends, and Monday is always the quietest day. 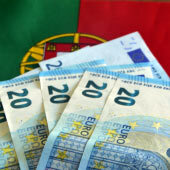 Guided tours avoid the need to queue for tickets or buses and pre-booked tours of Sintra are surprisingly inexpensive.